Hopefully this will help clear some things up.<br><a href="https://www.youtube.com/watch?v=0cNUdXXx-1g" target="_blank" rel="nofollow">https://www.youtube.com/watch?v=0cNUdXXx-1g</a><br><br><br>Update 2015-02-19: Added a new body with a cutout to use the grommet from the "new" feeders instead of a piece of bowden.<br>Update 2014-11-15: Uploaded length variations for the yoke, 35-40mm. I also added a zip with another version that has an included spacer for M16 screws so that you don't need to use washers. Six lengths included in the zip. Update 2014-09-14: I updated the yoke a bit and made it longer as I noticed it was too short for NinjaFlex for me.<br>Update 2014-07-29: I've re-designed parts of the feeder to get rid of a few parts that were causing people problems and also to strengthen it slightly.<br><br>Right, here's my second (public) attempt at a new feeder design for the UM2. 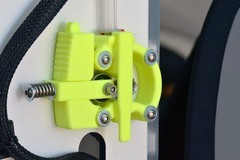 My goals were:<br>- Able to release the filament for quick and easy change between filaments.<br>- Re-use original parts from the old feeder.<br>- Try to minimize friction<br>- Supply additional guidance for flexible filaments (untested at this point and optional to install).<br><br>I've been printing with this design for about 20 hours now without any issues. That's not a guarantee that you wont have issues, no guarantees here.<br><br>Instructions:<br>All parts should be printed in the orientation that I've supplied them in. You should not use any support, all the support is built into the files and should be fairly easy to remove after printing. I would recommend a decent amount of infill for strength, I've used 20% so far. I've used 0.08mm or 0.1mm layer height and printed it fairly slow at 40mm/s.<br><br>On the arm there's a hole for a nut. If it's tight, you can force it into place by inserting a screw from the other side and screw it tight. If it's annoyingly loose and wont stay in place once you're trying to secure the spring just use a dab of glue. I managed to get it done with a nut that was floating completely free in there though, your patience may vary ;)<br><br>On the back of the case, at the entrance you'll find a cutout where you should insert a short piece of bowden tube (you can cut off a small section from your own tube, it will not hurt anything). Force it in with a screwdriver or whatever and it'll snap into place.<br><br>You may find that the knurled sleeve isn't centered well with the bearing. Loosen the set screw that holds it in place and slide it in a few millimeters if needed.